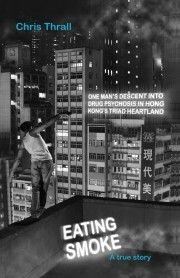 Chris Thrall, author of the unique tale Eating Smoke: One Man’s Descent Into Drug Psychosis In Hong Kong’s Triad Heartland, gives us insight into addiction, danger, organized crime, and more. Tell us about your new book, Eating Smoke. I left the British Royal Marine Commandos in 1995 to run a successful business in Hong Kong, but less than a year later was homeless, in psychosis from crystal meth addiction and working for the 14K, a Hong Kong triad crime syndicate, as a nightclub doorman in Wan Chai’s infamous red-light district. My memoir is unique in as far as it details this decent into the extreme from a first-person, frank, yet humorous perspective. You have quite an interesting background. Tell us a bit about that, and how it influenced your time in Hong Kong. Funnily enough, I joined the Marines for a bet, and then went through the grueling eight months of training to earn the coveted green beret. Commandos must possess a quality known as ‘cheerfulness under adversity.’ Even in the direst of circumstances, marines must have a joke at the ready – and this certainly helped during my darkest moments. Being in the Marines is not like having a regular job – it’s a lifestyle choice packed with extreme moments you don’t typically get to experience in what we termed ‘Civilian Street’. I’d served in the Northern Ireland Conflict and had a couple of serious run-ins with Organized Crime in some of the dodgier parts of the globe while on leave in the Military. So in Hong Kong, drugs, mental illness and the triad underworld just seemed a continuation of the crazy adventure I’d already been living. One of the most interesting aspects of Eating Smoke is that it is a true story. How hard was it to lay out such a difficult time in your life on paper like that? When writing Eating Smoke I had to relive old memories. Some brought a smile to my face – many saw me laughing out loud – but others reminded me of how unwell I became, the trauma I experienced, and how on a number of occasions I came so close to death. I don’t regret my Hong Kong experience, but I’m not sure how I feel about it, or writing about it, either. A big focus of the book is the time you spent working with the triads, an organized crime organization. Did you know what you were getting into when you took the job? No, I just thought I was getting a job as a nightclub doorman. On my first night at work one of the drinkers at the bar pulled me to one side for a friendly ‘chat’. He said ‘You know that everyone working here’s a triad?’ He went on to tell me that one of my fellow doormen was a ‘Violent Hand’ assassin who was regularly smuggled across the border into China to do a hit on someone, and the other doorman was a hard-as-nails foot-soldier, a sociopath who had only ever known the filthy backstreets of the Wan Chai gangland and was feared for picking up any object in a fight if he could smash an enemy over the head with it. I then found out that many of the western patrons in the bar had formed a secret triad crime syndicate of their own – and that’s when things started to get really bizarre. Do you ever fear any sort of retribution for revealing their secrets, as it were? My honesty is in describing my descent into psychosis from drug addiction. I happened to be working in a club run by the 14K Triad at the time. I didn’t divulge too much information about the triads, a lot of which you can find on Google or Wikipedia. That’s not to say that for people who haven’t experienced organized crime firsthand, Eating Smoke isn’t an eye-opener. What led you to the decision to write Eating Smoke? I wanted to succeed as an author. Society attaches huge stigma to drug addiction and mental illness and I wanted to show that you can emerge from such experiences and become the top of your game. When I walked through London’s Heathrow Airport and saw Eating Smoke at #6 on the bestseller list, above celebrity memoirs and established authors, I thought ‘Well done, Chris.’ Then I fought back tears. How has the experience of writing this book changed your life, for better or worse? Such a great question. It’s really hard to answer. When I was in Hong Kong for the book launch, I was treated as a celebrity by the readers and the Media. I even had one of the bookshop staff assigned to me for the night just to make sure my wine glass was always full. Combined with the unbelievably kind emails, book reviews and Facebook following I have received, it’s been a special part of my life. However, when you consider that I’ve had to expose a particularly sensitive aspect of my history to family, friends and the general public, it’s kept me on the level. In reality, I don’t feel any different a person to when I was wandering the streets homeless at fifteen. Life is just life to me. I try to ride the ups and downs and keep myself centered somewhere in the middle. Your personal struggle with methamphetamine addiction caused your life to take a drastic turn. Take us on a bit of that journey; was it a gradual decline, or a more instant fall? Contrary to misconception, addiction isn’t something you choose. I got introduced to a drug, crystal meth, which masked all my insecurities and taught me things – like writing – I was told I was a failure at in school. It made me feel like the person I wanted to be. I knew from Day One I was powerless to say no and that the journey I’d embarked on would have a fair few challenges en route. The fact I was prepared to take the journey is irrelevant. With addiction, you have no choice. You don’t buy the ticket but you take the ride. I’m fortunate to have come through it with no major harm done. I feel more informed because of it. Through all of the hardships you endured, what one moment stands out as rock bottom for you? To be honest, recovering from addiction, there are a series of ‘awakenings’ in the form of all-time lows. One night in Hong Kong, I found myself shinning across a wire cable between two skyscrapers, seventy meters above ground, doing something the Marines call the ‘Commando Crawl’. In my deluded state I believed I had to prove myself to everyone by doing this. My thoughts flicked to my younger brother and what he would make of my behavior. In a moment of clarity, tears poured down my face and I realized I didn’t need to prove anything to anyone in this world – except him. What sort of encouragement can you offer to others who are still in the grips of their addictions? That there are days when you wake up and the world isn’t the way you want it to be and that’s exactly when you must believe in yourself and strive towards your dreams. Look for our review of Eating Smoke in the coming week.